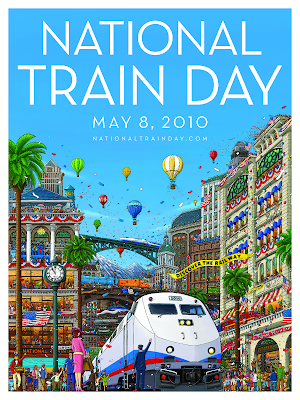 The poster is for National Train Day 2010, a nationwide celebration of trains on May 8. It's a very nice design, because it looks great from a distance (all that blue!) and also has all these fun details that you can only see up close (like the name and number on the back of the jersey on the kid standing alongside the train, to point out just one that I thought was neat). Plus, it was memorable enough that after seeing it around noon, I thought to look it up hours later. You can click the image above for a larger version, but I recommend clicking here to see the high resolution pdf version, and be sure to zoom in nice and close. So, does anyone know who drew this poster? EDIT: I know who drew this poster! It was IC4DESIGN. How do I know this? The kind person posting at National Train Day's twitter account told me. And check out IC4DESIGN's portfolio. Great stuff! 1. Attending the 2:00 pm panel "The Art of the Superhero: When Singular Vision Meets Popular Mythology." With Frank Miller, Jaime Hernandez, Paul Pope, Kyle Baker, and Dean Haspiel. In my opinion, this panel includes four of the best comic book creators ever (I'm not putting Haspiel in the same league, perhaps only because I don't know his stuff as well -- the only work of his that I've read is the Toon Books children's comic Mo and Jo: Fighting Together Forever). And one of these guys -- Frank Miller -- is, basically, my favorite. For a long time he's been my favorite. I have everything he's written, except for that issue of Spawn, and I owned that at one point but sold my Spawn issues a couple of years back. I saw Miller at a convention at the Jacob Javits Center in New York City in ... 1994, I think? Dark Horse had just launched its Legend imprint with new work from Miller, Mike Mignola (Hellboy), Geof Darrow (Big Guy and Rusty the Boy Robot), Art Adams (Monkeyman and O'Brien -- never went anywhere with that), and John Byrne (Next Men). Miller, Darrow, and Adams all did a panel together, and I remember that somebody in the audience asked how long it took each of them to make one page of a comic book. Adams said it took him one day to draw one page. Miller, who was in the middle of his Sin City phase, said that he could layout, draw, and ink four pages in one day, which astonished Adams and Darrow Then Miller and Adams looked at Darrow together, who smiled, and everyone cracked up because, as everyone knows, Darrow's drawings are RIDICULOUSLY DETAILED. Darrow then revealed it took him about four days to draw one page. I'm not sure why I remember this. But maybe I'll ask the same question at this MoCCA panel; I kinda like it. It's a knockout. While I'd have a difficult time naming what the number two book of this year's show would be, for my personal taste, Soft City is the only contender for number one. I'm really excited to dive into all of the purchases I made this past weekend, but they're going to have to be comic books that french kiss me while singing At The Drive In's entire catalog to knock Soft City out of the top spot. It's beyond remarkable, and I can't stop wondering what the "canon" would look like if the original pages hadn't been lost in a suitcase since the mid 70's. There were a ton of comics and creators at this year's show that are possessed with a talent I remain in awe of--people like Gary Panter, Frank Santoro, Seth, David Mazzucchelli and more--but my experience of Soft City is best described as being kicked in the stomach by skill alone. It's a brilliant work of art. I've found that Tucker is right about what comics are good, so, yeah, I'll be looking for this. 3. Buying -- maybe -- Dash Shaw's new book, BodyWorld. I haven't seen it confirmed anywhere that BodyWorld will be debuting at the show, but I'm nearly certain that this sure-fire addition to the year-end "best comics" list will be available. Follow my logic on this one. At last year's MoCCA, the publisher Pantheon brought copies of the then-unreleased Asterios Polyp, by David Mazzucchelli, to the show. Mazzucchelli also attend the convention to sign copies, and the book got a lot of good buzz, helping to build momentum for it to eventually be named as the Best Comic Book of 2010 on the Meta-List. Similar to last year, Pantheon, which is publishing BodyWorld, will have a table. Shaw will be in attendance. The book is being released next Tuesday, the 13th, which means it's been printed and is ready to go. I would be shocked if Pantheon didn't take advantage of this opportunity to roll out its highest profile 2010 comic book. 4. Picking up the "MoCCA Special" from Traditional Comics. This $10 four-pack of comics by Ben Marra includes Night Business #1-3 and Gangsta Rap Posse. I've heard good things about these books, and even in a year in which the number of blaxploitation-parody comics created by white dudes is at a peak (see Night Business, Afrodisiac, and Vatican Hustle), I'll give 'em a shot. 5. Pood. Yeah, the name & manner in which the creators rolled it out kind of annoyed me too, but this newspaper-sized anthology debuting at MoCCA sounds pretty great. And it's only four bucks! 6. Asking Faryl Dalrymple about The Wrenchies. Dalrymple drew one of my favorite super-hero comic books, Omega: the Unknown, and he's working on The Wrenchies, to be published by First Second at some point. But he's never said when it will be published, and I plan on cornering him to ask him that very question. 7. Checking out the 4:00 pm panel "Best of the 00s: Artists On Their Favorite Comics of the Decade." If you are a regular reader of this blog, you might have figured out that I like it when people talk about their favorite books, preferably by ranking them in a year-end or decade-end list. This panel, with board-certified interesting people Eric Reynolds (Fantagraphics), Nick Bertozzi (The Salon), Alex Robinson (Too Cool to be Forgotten), and Becky Cloonan (Pixu), should be right up my alley. 8. Getting a doodle in a self-published comic book from Lucy Knisley. I kinda love Lucy Knisley's drawing style, and last year I got her Pretty Little Book. I was so excited about it that I completely forgot to ask her to sign it or draw in it, which is one of the best things about comic book conventions. I won't make that mistake this year. 9. Buying Twin Spica. Manga publisher Vertical (Black Jack, Buddha) is debuting Twin Spica, a comic about a group of Japanese high school students training to become astronauts. Tom Spurgeon wrote that it is "a surprisingly compelling read" and that "there's a cogency to the final package," and I'm all about cogency. Seriously, though, I keep coming across good reviews of this one, so I'll be picking it up. 10. Walking around the show with my Dad. I've been giving comics to Dad to read over the past year or so, and he seems to like them! Or most of them, anyway. (Quick rundown of Dad's responses: liked Astro City, Tamara Drewe, Britten & Brulightly, Daredevil: Born Again, and Batman: Year One; lukewarm on Parker: The Hunter; disliked The Ultimates and All Star Superman vol. 1 -- he's not a fan of Frank Quitely's drawings.) We're going to grab a sandwich at the Beat-recommended Lamazou and wander the aisles at the show. I can't wait. So, anybody else going? If so, what are you looking forward to doing? 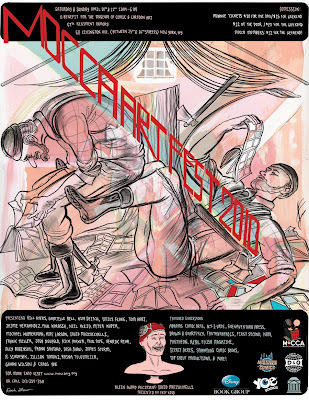 Related: Here is my recap of last year's MoCCA.